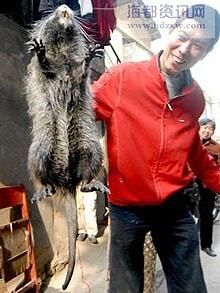 A giant rat with one-inch-long teeth has been caught in the southern Chinese province of Fujian. The rat, which weighed six pounds and had a 12-inch tail, was caught at the weekend in a residential area of Fuzhou, a city of six million people on China's south coast. The ratcatcher, who was only named as Mr Xian, said he swooped for the rodent after seeing a big crowd of people surrounding it on the street. He told local Chinese newspapers that he thought the rat might be a valuable specimen, or a rare species, and had to muster up his courage before grabbing its tail and picking it up by the scruff of its neck. "I did it, I caught a rat the size of a cat!" he shouted out afterwards, according to the reports. Mr Xian is believed to still be in possession of the animal, after stuffing into a bag and departing the scene. The local forestry unit in the city identified the nightmarish creature as a bamboo rat from initial photographs, but said that it would need to examine the rat more closely before making a final identification. Chinese bamboo rats rarely grow beyond ten inches and are found throughout southern China, northern Burma and Vietnam. However, the Sumatra bamboo rat, usually found in the south-western Chinese province of Yunnan and in the Malay Peninsula can grow up to 30 inches long, including tail, and can weigh up to eight pounds. A "Giant Rat of Sumatra" is mentioned in the Sherlock Holmes tale: The Adventure of a Sussex Vampire. All bamboo rats are slow-moving and usually spend their time in underground burrows, feeding on bamboo. Chinese bamboo rats are often sold for meat in Chinese markets. The largest rats in the world are thought to be African giant pouched rats, which can grow up to 36 inches in length.